Core Java® has long been recognized as the leading, no-nonsense tutorial and reference for experienced programmers who want to write robust Java code for real-world applications. 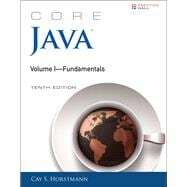 Now, Core Java®, Volume I–Fundamentals, Tenth Edition, has been extensively updated to reflect the most eagerly awaited and innovative version of Java in years: Java SE 8. Rewritten and reorganized to illuminate new Java SE 8 features, idioms, and best practices, it contains hundreds of example programs–all carefully crafted for easy understanding and practical applicability. If you’re an experienced programmer moving to Java SE 8, Core Java®, Tenth Edition, will be your reliable, practical companion–now and for many years to come. Look for the companion volume, Core Java®, Volume II–Advanced Features, Tenth Edition (ISBN-13: 978-0-13-417729-8), for coverage of Java 8 streams, input and output, XML, databases, annotations, and other advanced topics. Register your product or convenient access to downloads, updates, and corrections as they become available. See inside the book for information.